WOW! That is really something. I remember those mounted up over the stage but they did NOT look this big at all. I would like to know the story behind his getting a hold of it. Im guessing it was a 2 piece deal. Thank You Bob Barber! That's pretty wild. Excellent addition to the Manual. 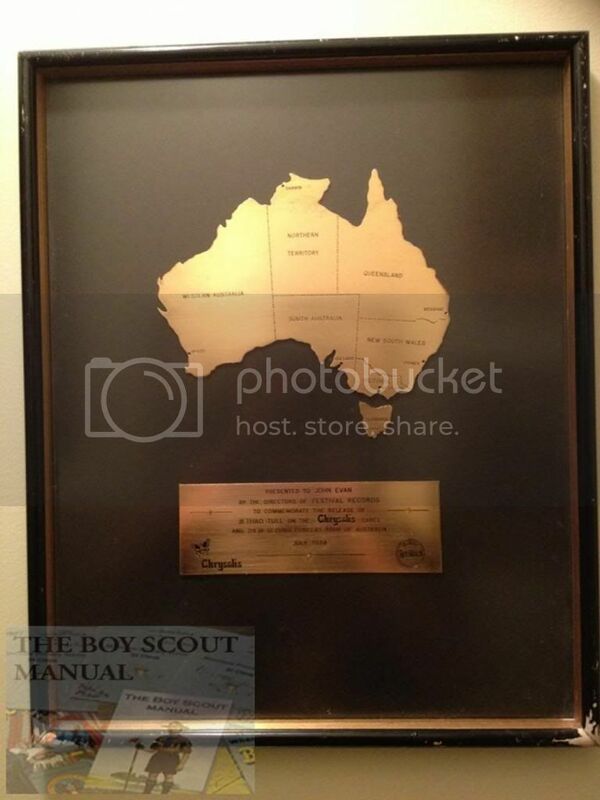 Here's another curio from Bob, celebrating Tull''s 2nd Tour of Australia, a gold award to Mr John Evan. What an addition to the Manual....thanks so much to Bob for these wonderful contributions!!! I didn't know APP had that on stage. I did see the post on FB yesterday. I liked when he said he had a very understanding wife...ha.